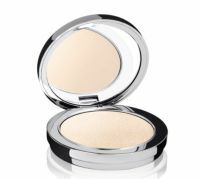 This fine, light-colored highlighting powder adds a pretty, pearlescent sheen to skin. It's easy to wear over blush. But whoa $57 is a lot for a highlighter! This ultra-fine-milled powder reminds me of the Becca Pressed highlighter that we all love. Super pearlescent and just gives off a gorgeous, radiant glow. This was a very smooth, easy to apply highlighter with a pretty shimmer. I wasn't crazy about the white shimmer shade -- it looked especially pretty on the browbone, but i prefer a more golden or iridescent color on my cheeks.